Many of our students come abroad with Go Global without knowing anyone else on the trip. 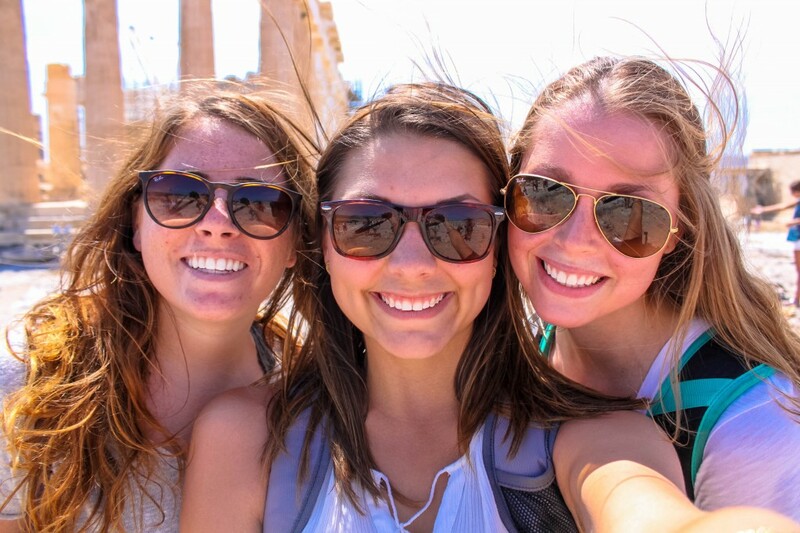 Hayley Howell, a senior at the University of Tennessee, made the decision to push herself out of her comfort zone and travel on LEAD Greece to make new connections! This whole journey can begin with a choice that I made last summer to begin living for myself. I can honestly say that I had spent the majority of my life pleasing other people and making sure everyone else was happy while I sat there enjoying their happiness and not experiencing enough of my own. I started my junior year of college on a completely new leaf. I began meeting new people and venturing out of my own comfort zone. I spent more time actually talking and listening to my friends rather than taking pictures and recording them on Snap chat. I went to my favorite restaurants alone, and I loved it. I started looking into what I wanted to do with my career and where I wanted to be a year from now. I applied for a new executive position on my sorority’s executive council, and eventually I was graced with the amazing opportunity of serving my sorority in a way that made me happy. From my first couple awkward ‘alone’ ventures to my favorite restaurants, to finding out what I really wanted in life, I started to do things that made ME happy. I’m a firm believer that everything happens for a reason. Last February, I had applied to study abroad in Dublin, Ireland, the following June with three other people from my major. I did this because I wanted to do something that made me happy, and I thought going with my school, with friends would be safe. The more and more I thought about traveling abroad with these girls on a program that was easy for me to get into, the more I started to become uninterested. I made a promise to myself that I would do things that made me happy, things that pushed me out of my comfort zone. Ironic enough, I came to find out in February the program was canceled because of the lack of interested students. In the midst of panicking about what kind of internships I should start applying for and what I needed to do to prepare for them, I got a text from my sorority sister, Taylor, with some encouraging words about finding somewhere to study abroad and how amazing the trip to Cape Town had been for her. She encouraged me to watch the video on Go Global’s YouTube page and I completely fell in love. On a whim, I decided to put my name and phone number in the system on the Go Global website for a representative to contact me about the trips. I wasn’t really interested in going to Cape Town because Taylor had gone – I wanted to do something different, and that something different was Greece. I was also terrified about traveling alone. Was I ready? Could I actually do this? Needless to say, later that day I got a phone call from Pierce telling me about the Cape Town trip and how exciting it was and how much she encouraged me to apply. It told her I was interested in the trip to Greece and that Cape Town sounded amazing, but my heart kept pulling me towards Greece. She immediately told me to hold on as she without my knowledge checked on the list of attendants for the Greece trip. She later called me back to say that ONE person had backed out and that there was a single spot for the trip left, a spot left for me. At that exact moment, I knew I had to go to Greece, and I had to do it alone. Without a doubt, coming on this trip alone has been the most rewarding experience. I have consistently pushed myself to venture out of my comfort zone and get to know some incredible people. We’ve climbed the Acropolis together, worked together in community groups, and even done some killer service projects with one another. The best part is, I’ve never felt so powerful and full of confidence in myself. This trip, even only a week in, has already changed my life, and I am so thankful for that.